It's less than a month until the Credit Union Cherry Blossom Ten Mile Run! I'm getting so excited, but something arrived in the mail the other day that ratcheted my excitement up to the next level. 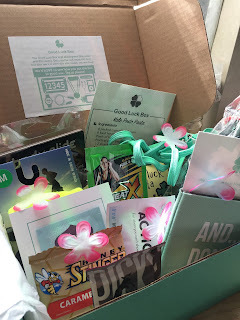 I received my first Good Luck Box! 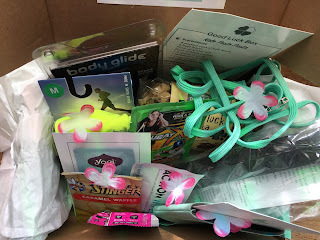 If you read my blog you know I love receiving gift boxes in the mail and I love running. This is the perfect combination of both. 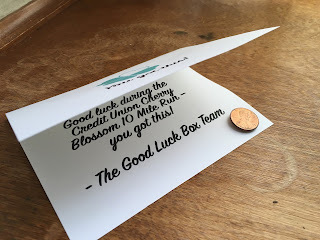 Good Luck Box was created by fellow runners who even ran on the day of their wedding! I met the creators when I started volunteering with the Cherry Blossom team several years ago and I'm delighted to be one of the recipients of this amazing box. I think they have thought of everything. First, the tissue was tied with shoelaces and had four safety pins attached! Perfect! And do you see all those little cherry blossoms scattered around? I can't even… WAIT FOR THOSE BLOSSOMS! Inside the box were tasty sweet treats like Honey Stinger waffles and and a new bar called Picky Bars. There's a tea bag for post race relaxing, there are wipes for when I can't shower right after a run (many times) and a pack of sports detergent from Sweat X. There's a new pair of balega socks, a Tiger Tail foam roller, and the ever useful Body Glide for all those tricky areas. I can't wait to try the Good Luck Kale Pesto Pasta recipe and use the drink kuzy thing. 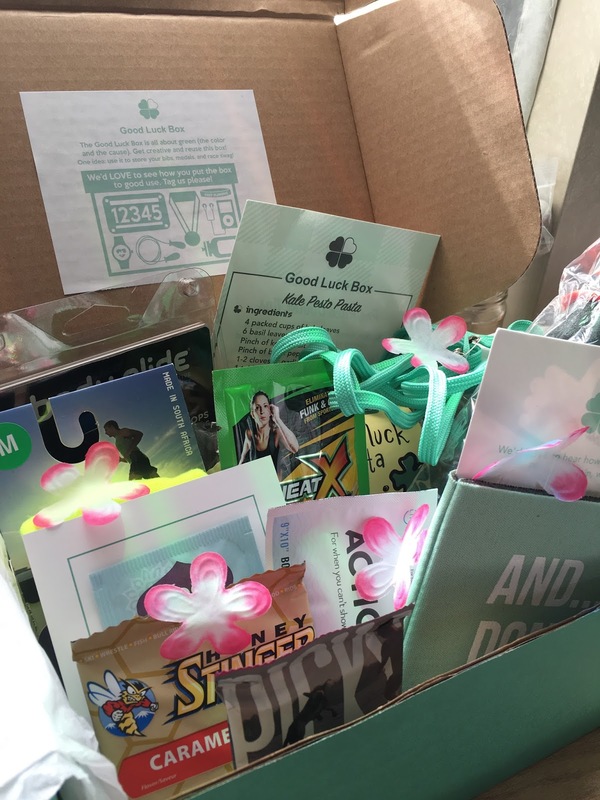 This box is perfect for runners. If you know anyone who is running the Cherry Blossom or any upcoming race, this would be a perfect gift. I cannot believe how much perfect running gear they packed into this box. But one of the things I love the most could be this little card with a lucky penny attached. When I'm out running, I always pick up lucky pennies that I find (as long as they are heads-up, right?). I carry them in that little key pocket inside my shorts or in the zip pockets of my winter running jackets. This card was the absolute best final touch! I am running the Credit Union Cherry Blossom Ten Mile Run with this penny in my pocket. 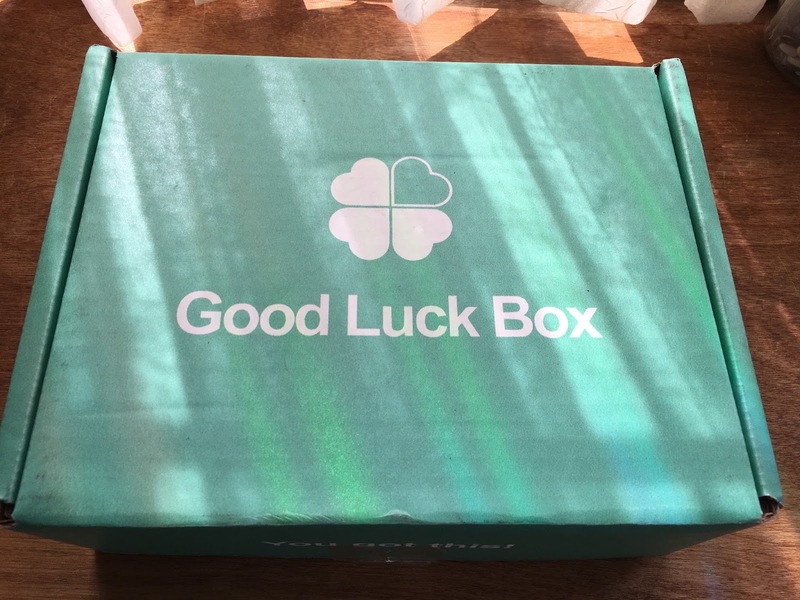 Thank you Good Luck Box!! See you race day.